You know, sometimes there are slots that don't really need a title - the money on offer is enough of an enticement. With NetEnt's video slot, Mega Fortune, it lives up to this reputation. Responsible for progressive jackpots that have literally (ok, not literally) torn up the record books, Mega Fortune was responsible in 2013 for rewarding one very lucky punter over €17 million. That's a lot of trips to Vegas! 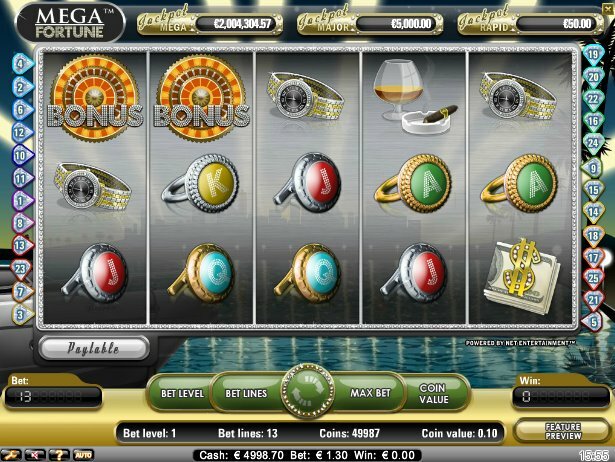 On the surface, Mega Fortune is a classic 5-reel, 25-payline online slot with all the Wilds, scatters, and nifty graphics you've come to expect from developer, NetEnt. On-screen there are plenty of icons relating to the booty you could bag as a big-time slots winner - shiny new Rolls Royces, speedboats, champagne, gold watches and cigars. Even the card symbols, 9-through-Ace, are here represented on gold rings. There's a bit of neat, if unspectacular, animation on show too, with champagne corks popping and speedboats racing off-screen if you bag a winning combo. All this happens while a cheesy '80s-style jazz track plays over the top. In fact, you might be more comfortable slipping into some white chinos and slip-ons to play this slot (and turn down the lighting while you're at it). This slot is smooooooth. That plaything of the millionaires, the speedboat, is the Wild, and substitutes for any other symbol except the champers scatter and Wheel of Fortune bonus symbol. 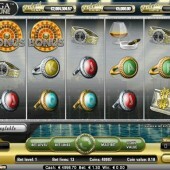 Three or more scatters wins you a multiplier up to 200x, and free spins can also be triggered. What’s more, during the free spins your winnings are multiplied up to 5x. That all sounds fine and dandy so far. But how do you get your hands on those mega-bucks? Well, simply get three Mega Fortune wheel bonus symbols in a row on the reels (easier said than done) and you'll jet off to the wheel-y exciting bonus rounds. The first wheel simply gives you a chance of a coin win or to play the next wheel. The second and third wheels give chances of a coin or jackpot win. Spin the wheels - if a wheel stops on a jackpot, the jackpot is yours! Remember, the jackpots are progressive, so bet at the maximum coinage and you could be raking in the fortunes yourself. If progressive jackpot slots are what you're interested in, they don't come much bigger than Mega Fortune. It combines an enticing gaming experience with the chance to win a life changing amount of money. However, should you find yourself in need of more classic progressive action, then maybe head over to another 'mega' slot in the shape of Microgaming's jungle-themed slot, Mega Moolah, which has been coined 'The Millionaire Maker' for its record-breaking jackpots in the past. Microgaming's other jungle-themed game, Big Kahuna, offers similarly impressive jackpots, and together with Mega Fortune should form your Holy Trinity of progressive jackpot slots.